This invention relates to a mumble peg toy, etc. The object of my invention is the provision of a simple and efficient device for playing the game of mumble peg, or for use as a household tool, such as a nut-pick or an ice-pick. Another object of my invention is the construction of a toy for playing mumble peg, which, when not in use, can be folded, so as to not injure the pocket or the individual carrying the same, but when it is desired to play the game, the device can be quickly adjusted for action. The Paradise patent was featured in John Morris’ presentation on “new” patent discoveries at our Chicago AGM in 2012. 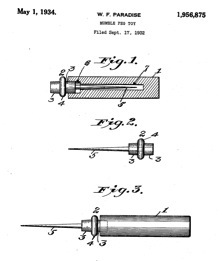 The patent description doesn’t mention the addition of a corkscrew to the Mumble Peg Toy. However, fortunately for us, Paradise included a Williamson bottle opener/corkscrew! The fact that Paradise also mentions the use as an ice pick does bear mentioning, not only does it like one, and surely could be used for that purpose, but William F. Paradise was involved in the ice industry. According the 1920 publication Clay County History by W.H. Woodson, “William F. Paradise [is] a progressive man of Liberty, is proprietor of the Liberty Ice and Cold Storage plant, one of the important institutions of the city. 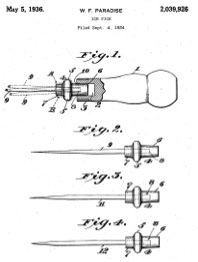 And, in 1936 he was awarded patent number 2,039,926 for his “Ice Pick,” which references the mumble peg toy, explaining, “This ice pick is an improvement upon the device disclosed in my prior United States Patent No. 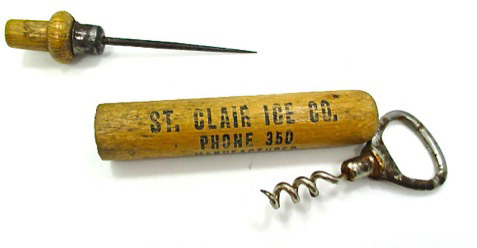 1,956,875, issued May 1, 1934.” Similar in design to the Mumble Peg Toy, with the removable ice pick, the pick fits into the handle for storage. Now, I will have to admit, I didn’t know the rules of the “…old time mumble peg game..." And, as kids my brothers and I did play our own game, which involved sticking a pocketknife in the ground. But, this also involved throwing the knife as close as possible to the other brother’s foot. Not something I would recommend, by the way. After a little research, there seem to be multiple incarnations of the mumble peg game, which is also known as mumblety-peg, mumbledy-peg, and mumble the peg. 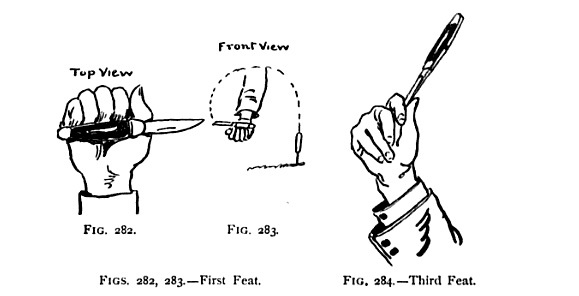 Apparently, one of these approaches to the game, involves standing opposite your opponent with feet shoulder width apart, and one proceeds to throw the knife, or in an Addict’s case, a 1934 William F. Paradise patent downward, towards your own feet—sticking the pointed end into the ground. Of course, one of the more disturbing rules mentioned is if one actually strikes one’s own foot, they automatically win the game. 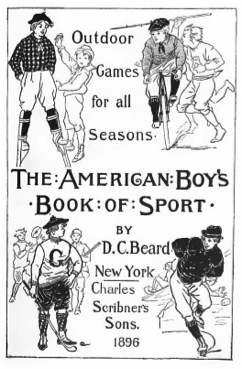 Knowing that pocketknives, or Paradise patents, sticking from one’s foot is probably not the best idea, I decided to do a little further research, and then ran across The American Boy's Book of Sport: Outdoor Games for All Seasons by Daniel Carter Beard from 1896. Within this text, the rules of Mumble Peg are outlined. The pages that follow are the rules and illustrations from the 1896 volume, just in case you wish to challenge a fellow Addict to a game. A Summer’s day, a shady nook, a close-cropped green sod, two or three boys, and a jack-knife are the things necessary for a quite game of Mumbly Peg. The first player takes the knife and goes through as much of the game as he can without a blunder. The second player follows in turn, doing the same. The last one to perform all of the difficult feats is beaten, and must pull a peg, two inches long, from the ground with his teeth. 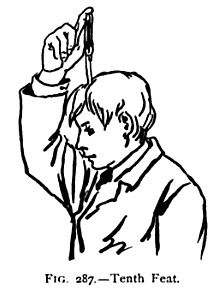 The winner drives the peg with the knife-handle for a hammer, being allowed, but the rules of the game, three blows with his eyes open, and three with his eyes closed. as the defeated player, unaided by aught his teeth, literally roots, until, with a dirty face and broad grin, he lifts his head, showing the peg between his teeth. From the penalty that the loser pays comes the name of Mumbly or Mumbelty-Peg. Second—the next motion is the same as the one just described, but is performed with the left hand. Third.—Take the point of the blade between the first and second fingers of the right hand, and fillip it with a jerk so that the knife turns once around in the air and strikes point into the ground (Fig. 284). Fourth.—Do the same with the left hand. Fifth.—Hold the knife as in the third and fourth positions, and bring the arm across the chest so that the knife-handle touches the left ear. 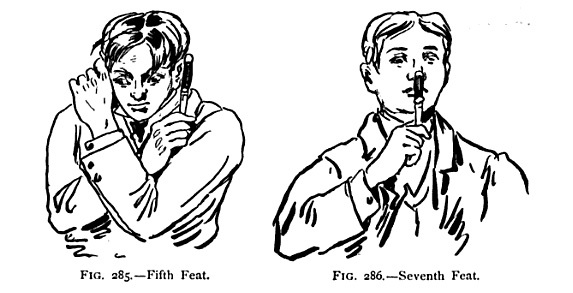 Take hold of the right ear with the left hand and fillip the knife so that it turns one or twice in the air and strikes on its point in the earth (Fig. 285). Sixth.—Do the same with the left hand. Seventh.—still holding the knife in the same manner, bring the handle up to the nose and fillip it over through the air, so it will stick in the ground (Fig. 286). Eighth.—Do the same with the handle at the right eye. Ninth.—Repeat, with handle at the left eye. Tenth.—Place the point of the blade on the top of the head. Hold it in place with the forefinger, and with downward push send it whirling down to the earth, where it must stick with the point of the blade in the earth (Fig. 287). Eleventh to Fifteenth.—Hold the left hand with the fingers pointing up, and, beginning with the thumb, place the point of the knife on each finger described above, and the forefinger of the right hand on the end of the knife-handle. By a downward motion, throw the knife revolving in the air, so that it will alight with the point of the blade in the sod (Fig. 288). Sixteenth to Twentieth.—Repeat with the right hand up and the forefinger of the left hand on the knife handle. Twenty-first, Twenty-second.—Do the same from each knee. 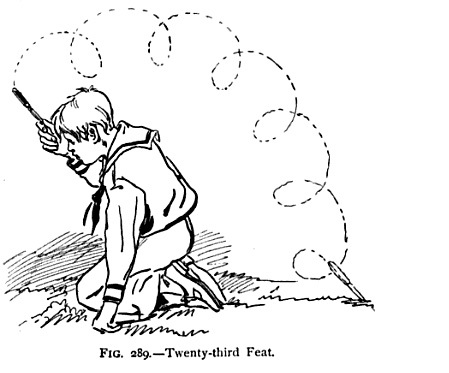 Twenty-third.—Hold the point of the blade between the first and second fingers and, placing the hand on the forehead, flip the knife back over the head, so that it will stick in the ground behind the player ready for the next motion (Fig. 289; dotted lines show the flight of the knife). Twenty-fourth.—After twenty-three the knife is left in the ground. Then with the palm of the hand strike the knife-handle a smart blow that will sent it revolving over the ground for a yard, more or less, and cause it to stick in the ground where it stops. This is called “ploughing the field” (Fig. 290; dotted lines show the flight of the knife). When a miss is made the net player takes his turn, and when the first player’s turn comes again he must try the feat over that he failed to perform last. A good player will sometimes go through almost all twenty-four motions without failing to make a “two-finger”—that is a fair stick, each time; but it is very unusual to run the game out in one inning. This is a game in twenty-four motions; many boys play it with double that number. If you have a Paradise patent Mumble Peg Corkscrew, I would enjoy hearing from you. It would be interesting to add it to the page, and also see what various advertisments there are on this particular corkscrew. Feel free to email me, and I will add yours. 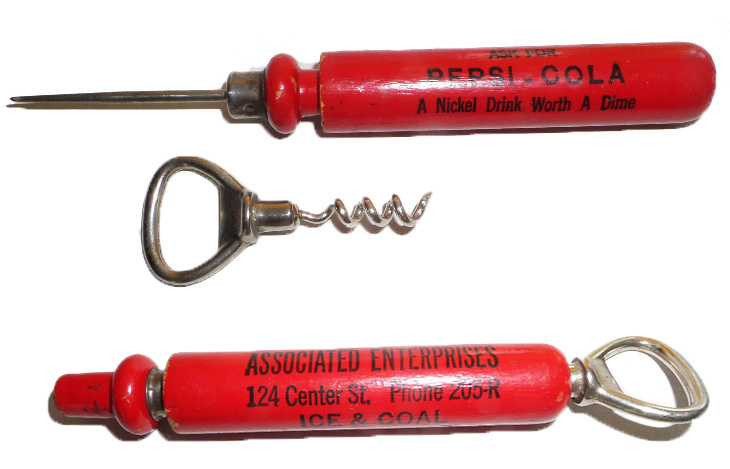 I will buy your Paradise Mumble Peg / Ice Pick Corkscrew!! !